My very favorite part of the hobby is building the models - I've been pretty good about painting the stuff I already have built recently and not adding to the pile of unpainted minis (much). Of course that all changed over this past weekend! I've often thought it would be fun to do a Dark Angels army over the years but I'd never taken the plunge - with the new release of the codex though, I jumped right in! As usual, I started off by saying "It'll just be a little boutique army, I'll keep it reasonable and relatively inexpensive." NOTE: THAT NEVER WORKS OUT LIKE I PLANNED. After the dust cleared, and I started tallying up the units I'd bought it turns out that it's going to be another 3500 point monster. Argh. So the next step was to narrow it down to what I'd theoretically be taking to Adepticon and just focus on working on those models for now (mostly). 1850 points doesn't go nearly as far with the Dark Angels as it did with the guard, but that means I'm no longer on the hook to transport 100+ infantry and a half dozen vehicles. The first draft of the new list was centered around a Deathwing detachment, backed up by a few 'vanilla' Dark Angels squads and one of the Nephilim fighters for light air cover. I wasn't particularly impressed with the finecast Belial released alongside the DA, so I figured I'd build one of my own using bits from the Deathwing terminators kit and some miscellaneous bits from the Closet of Doom. All in all a simple little kitbash and I'm rather happy with it. It should stand out enough with the back banner that there is no confusion about who he's supposed to represent. The first Deathwing terminator Squad built from the new plastics was a relatively straightforward 'tactical' squad armed with Power/Chain fists and Storm Bolters. I did want to build out the squad with a Plasma Cannon in lieu of the standard Assault Cannon, which will help distinguish them from the terminators that came with the Dark Vengeance kit. I'm thinking I may swap out one of the SB/PF terminators from this squad with one of the 'repeats' from the DV squad so each model in both units are unique. The second Deathwing terminator Squad was built as an 'assault' squad, armed with Thunder Hammers and Storm Shields for the base troopers and a sergeant with Lightning Claws. I did have to use one Thunder Hammer from a 'vanilla' terminator as I only had 3 of the DA hammers that came with the Deathwing terminator boxes. There were plenty of Storm Shields though, so they all got the fancy DA versions! I'm not entirely sold on the Deathwing Knights - love the aesthetic but the rules are somewhat underwhelming. If there are to be any major changes to the army list for Adepticon, it will be the removal of this unit in favor of something else, maybe another Tac squad, or some scouts and another tank. Plenty of possibilities! The Nephilim Fighter is getting some derision heaped upon it on the blogs and forums it seems, but for me it's a must-have based solely on the Rule of Cool. I love how it looks, so it goes in the army! There are times when it is better to LOOK marvelous than to actually BE marvelous... Hah! To give the army a little tank-y goodness, the ever popular Vindicator is the choice du jour. I dug up some old Dark Angel upgrade frames I had lying around and spent some time playing "Pimp My Rhino Variant". The siege shield is magnetized for easy modification (and painting). I had enough leftover bits from the Deathwing boxes to make a number of other models, though I needed to do a bit of a delve in the Closet of Doom to come up with sufficient legs and rear torsos. This Deathwing Librarian is a mish-mash of Grey Knights, Deathwing, and 'vanilla' terminator bits, plus some books and purity seals. Not totally sold on the use of the GK head, I'm thinking I may replace it with a more traditional terminator helmet. Another unit built in the frenzy that isn't intended for use in the Adepticon list is a Deathwing Terminator Command Squad. Again, this unit is built with the leftovers from the build of the three squads of Terminators shown above, plus a mish-mash of other bits from the CoD. 22 Terminators built from 3 boxes of the new Deathwing kit - not too shabby! I'm waiting for a few bits to arrive in the mail intended for the Assault squad, but other than that I just need to get a break in the cold weather so I can get these units primed and painted. I have 3 months from today to get the army finished. Should be doable, but it does mean I need to get in gear and start cranking through 'em! 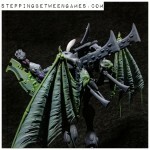 Your Belial conversion looks great, I didn't doubt for a moment who he was! That's a great Belial conversion. I still hate that "gimmie a hug" pose on the Deathwing knight, but at least he's not another pointing mini. I love that flyer. Is it wrong that I want 2? The Nephilim is one of the few new DA models I actually like. Case in point - your Belial mashup looks SOOOOO much better than the new sculpt. Good stuff mate and personally like the GK head on that Librarian, makes him different. Echo everyone else, the Belial is a great result. I'll be doing something very similar for my own (The First Legion is calling me back). I do like the look of the Nephilim and if I wasn't doing a pure Termie/Dread list for Zone Mortalis i'd prob have to include one purely for the look of it. @Matthew Ochs: Excellent! I'm rather pleased with how it turned out. @Rictus: Excellent! I'm looking forward to seeing what you come up with, I always enjoy your work! looking good, your poses on the terminators look great, better than the GW ones I reckon! I'm going to have to echo what's been said about Belial. When I first saw the model I was trying to workout how you got a plastic version of the model! 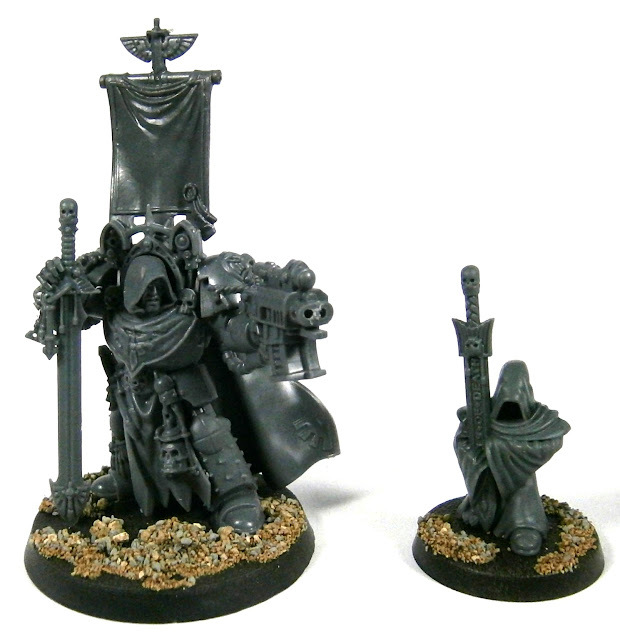 Now that's the truth of a really clever conversion! Terminators have always been the best part of any Dark Angels army, and your excellent models are no exception. Can't wait to see them painted up, especially Belial. Is it my imagination, or does the Nephilim need some kind of nose extension? I like the lower placement of the engines and the downswept wings, but it seems they're one step away from making it resemble a Thunderbolt. @#2501: I agree about the terminators, can't wait to get painting! As far as the Nephilim goes, it does have a bit of a mini-thunderbolt vibe to it. Of course, I don't see that as a bad thing, the Thunderbolt is hands down my favorite flyer! I'm with you man, I wasn't all that into the Belial mini. His pose just doesn't look right to me, something about his legs. They are looking good man, nice to see yours as i'm working on mine as well! What a great Belial, and I also really like the thrifty use of the new Terminator kits to get the maximum of possible models out of the deal ;-) I've linked to this on my latest blog post in order to illustrate a point - hope you don't mind! @KrautScientist: Thanks! I knew as soon as I saw the sprues that with some relevant bits diving through the boxes I'd be able to make a whole mess o' terminators! Really dug your post on the EternalHunt blog, thanks for the nod!